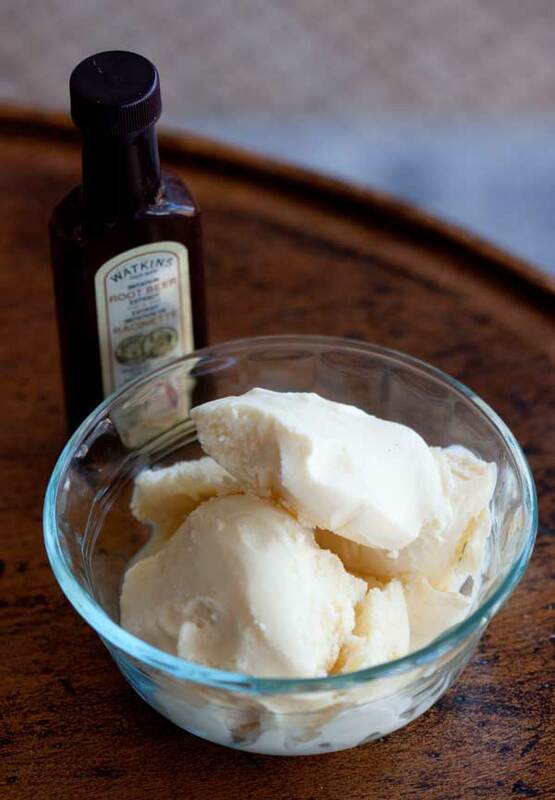 Root Beer Gelato is simply vanilla gelato flavored with root beer extract. I used Watkins, but any brand will do. Adjust the root beer flavoring to suit your taste. Put the milk in a saucepan and heat until it begins to simmer. Meanwhile, in a mixing bowl, whisk the egg yolks with the sugar and salt. Slowly pour about half the hot milk mixture into the egg mixture, whisking constantly, then pour it all back into the saucepan. Heat, stirring constantly with a wooden spoon, until mixture reaches 185F. Remove from heat and pour into a bowl or into a rectangular casserole dish (for faster cooling). Whisk in the heavy cream, then whisk in the root beer flavoring and vanilla. Let cool slightly at room temperature and then chill for 6 hours or overnight. Pour into ice cream maker and churn according to manufacturer's direction. Freeze for another hour or so before serving. Combine the sugar and water in a small saucepan and bring to a boil. Remove from heat, stir well, and let cool. Add the extract. This mixture is very strong. To use it, simply spoon a very tiny amount over the root beer ice cream.